The life of a blogger can be glamorous (like two days out of the year). Let’s be real though, most days, it’s unwashed hair, sweats and a paintbrush in hand. Seriously though, I’m constantly moving things around the house, working on some DIY project or writing and I like to do all of those things in my comfy clothes. I wanted to share a bit about The Glamorous Side of Blogging because it’s usually not glamorous (you can ask my husband or those that see me everyday in carline pickup)! By the way, how fitting is the post today, talking about “The Glamorous Side of Blogging,” with me in my workout clothes? Ha! When I was featured in Better Homes and Gardens Magazine earlier this year, I wrote a post telling you all about it. Mainly because, it had been on my work bucket list for quite sometime and I just was so excited to be able to cross it off. I felt like if I had something published then I’d feel more professional or like I’m doing a real job. I know I’m doing a real job because I’m clocking hours, am stressed and am getting things done; but internally, I needed or wanted a published article. You can read about how I felt to be featured, if you are curious. It’s actually quite funny because in that post, I told you all that our Christmas Front Porch was dropped from a feature and that I was disappointed about it but, come to find out, that was not the case! I thought that when I was contacted last year by Country Sampler back in July that they were talking about publishing the article for Christmas 2016. NOPE! I got a surprise last month when Country Sampler sent me the magazine that I was featured in and it was the Christmas publication for this year. Anyways, I had thought that the porch got dropped but apparently it was just scheduled 15 months later for publication. Is that not a crazy time period? 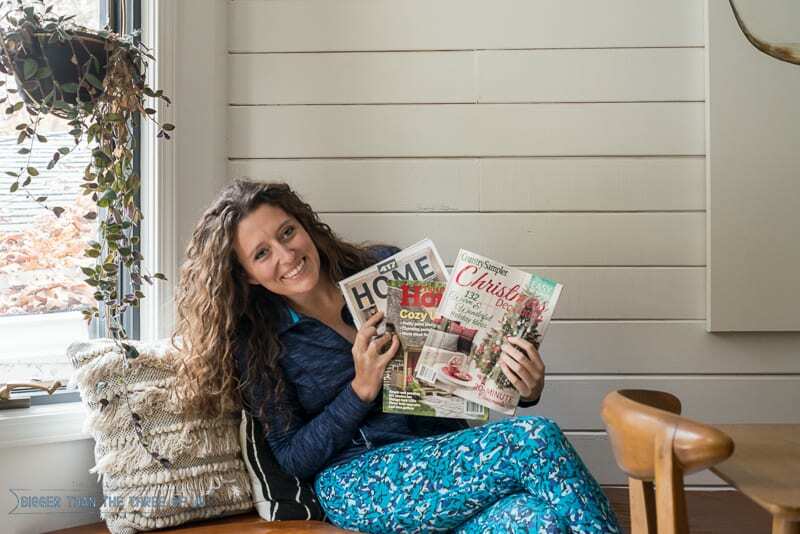 I learned more about magazine publication timelines at the Better Homes and Gardens Stylemaker event (read the recap if you missed it) and what they said was pretty much in line with what I saw from the Country Sampler publication cycle. Here’s the Country Sampler Christmas Edition and my old front porch. I’m getting ready to start decorating my porch for Christmas this year. It will probably look similar to that but more modern. See the Christmas Front Porch blog post if you want to see more. 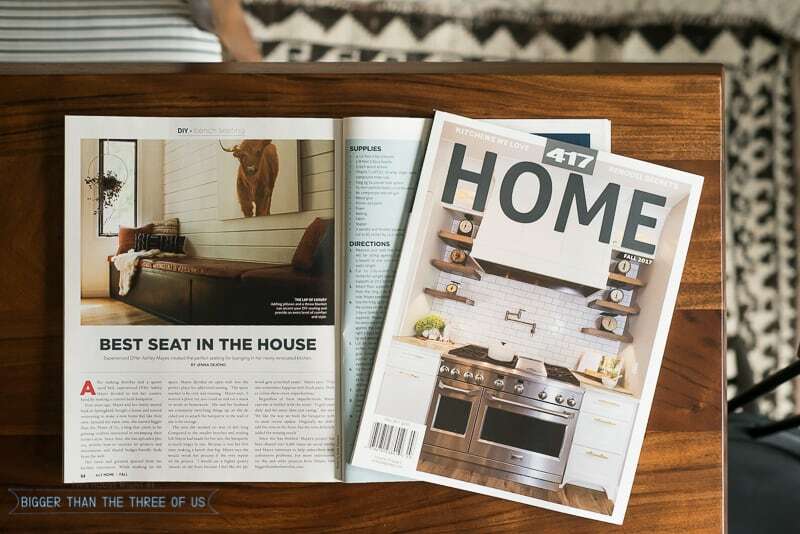 417 Home is a local publication and they came to shoot our built-in bench seat. If you missed the step-by-step tutorial for the bench seat, make sure to check it out. 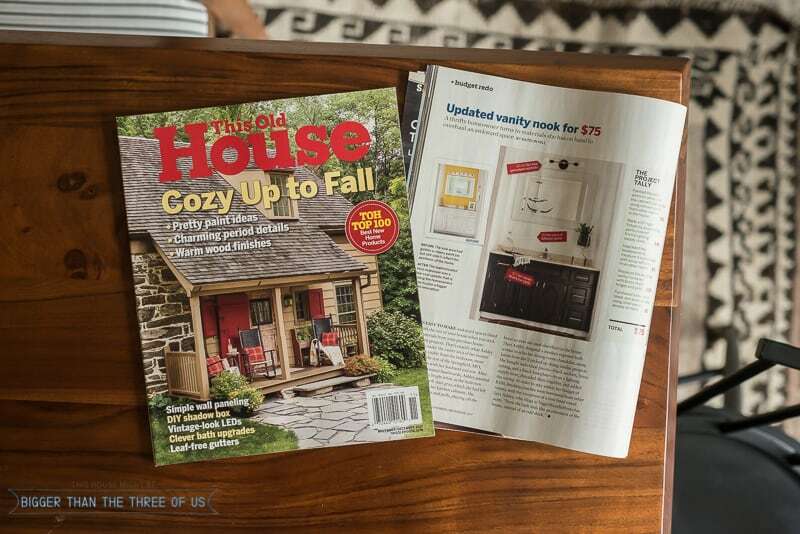 Last but not least, This Old House, published my $87 Bathroom Update from the $100 Challenge. I’m so thrilled that that particular project got picked up because it’s one that ANYONE can do and I think it definitely shows that you don’t have to have a ton of money to make a space better. Do I love the space? No, I don’t but it feels like an extension of my room instead of the eyesore it used to be. It’s definitely a space that I can live with for years until we can afford a gut job of our master bathroom. 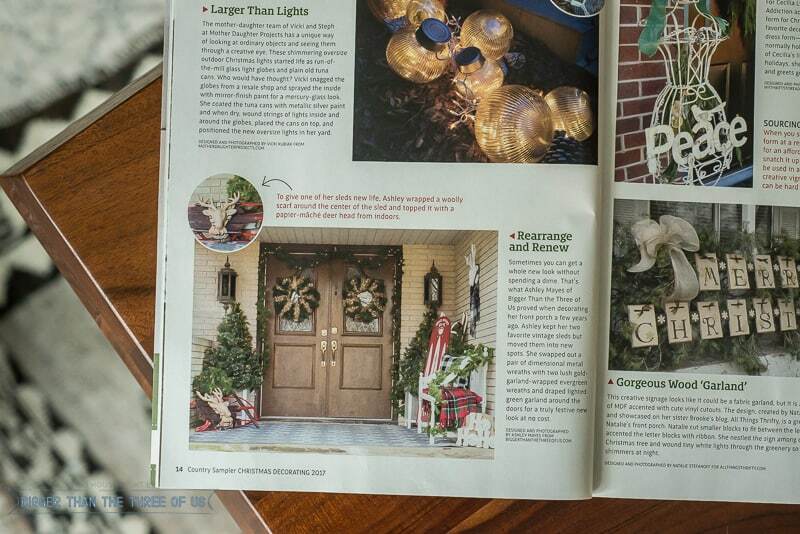 This Old House and Country Sampler used my own images. 417 Home sent a photographer out since they are local. It was fun to see how all the magazines operated both with images, editors and interviews. It’s definitely been a pinch-me moment every time something gets published, especially since the pay is so good! Ha! Just kidding. None of these publications were paid… like at all. It takes time and effort to send what each magazine needs, to be interviewed and to write up a summary of the interview and none of it is paid. But, for me, it’s something to add to my media kit and it’s a personal accomplishment.